Have you ever considered using your pasta maker to make homemade phyllo from scratch? You will not believe how easy it is to make homemade phyllo in no time! I’ve been using the pasta maker for eons to make phyllo and one day it occurred to me to join the pieces together to make a larger one. What I did was set the tripod on the only free space available in the kitchen and focus on the working area. As you see from the picture and in the video, the stand mixer is where the fruit are and right behind me is the kitchen table. In order to speak to the camera I had to lower down my body and also later on, while rolling the dough I had to put my back to the camera in order to reach out to roll the phyllo. There are two types of pasta makers. One which works manually and the other which is an attachment to stand mixers and therefore works automatically, when the mixer is on. While working with your pasta machine, set it on Number 1, which has the widest gap. If the dough breaks or the stripe of phyllo comes out too narrow, fold the sheet again and repeat, until it comes out fine. While folding it try to get the most of it’s width, which is around 15 cm. Then work your way increasing the number so that the gap becomes narrower and the phyllo comes out is thinner. Number 4 gives a thin phyllo and if you go up to number 5 you will get an even thinner phyllo, but you must be extra careful as it may tear. The only disadvantage of a manual pasta machine is that you only have one hand free to hold the phyllo, as with the other hand you will be turning the crank, so if you are not experienced, you will need someone to help you turning the crank, in order to have both hands free. The same procedure applies to the mixer attachment, only this one is numbered from 1 – 9 and rolling it here makes things much easier, as you have both hands free to hold the phyllo as it comes out. However, this is much more expensive than the manual one. To make pasta, there is a separate attachment, which gives the shape of the pasta, which we will not be using here. See my post for “Makarounotes Chilopites“. After making the phyllo, I made Spanakopita Strifti, which means twisted. Spanakopita is the most popular Greek pie, made with spinach, aromatic herbs and feta cheese. Other types of cheeses, like anari or anthotyros, which are soft whey cheeses, similar to ricotta can be combined with feta. You can also make the dough in your stand mixer. Attach the dough paddle. Put all the ingredients, except water, in the mixer bowl and mix on low speed. Gradually add water until the dough is ready and does not stick on the walls of the bowl. When the dough starts gathering on the dough hook and forms a ball, it is usually ready. Stop the mixer and test with your fingers to see if it is sticky. If it is, add a little bit more flour. Divide the dough into 5 – 6 equal pieces. Shape them into balls and then press to flatten. While working with the dough, flour your working surface regularly with flour, unless you are working on a non-stick mat. Also dust the dough regularly so that it will not stick. Set your pasta machine to the smallest number which is number 1. Each time you roll it out, dust it again with flour and continue the same procedure increasing the numbers, until you get the desired thickness. On the manual pasta machines if it is numbered from 1 – 6 go until 4 – 5. On mine it is numbered from 1 – 9, so I go up to 7 – 8. Meantime, wash the spinach, removing the stems or any damaged leaves and dry. Frozen spinach reduces the time of preparation considerably but defrost before using. Squeeze it with your hands to remove all fluids. Alternatively, if fresh spinach is used, when still wet you can put them in a big saucepan, without any additional water, and bring to a soft boil for about 5 minutes, until it wilts. It will become soft and its volume will be reduced. Place it in a colander to cool and when it can be handled, drain any water by squeezing it. In both cases, cut it into smaller pieces. Divide the dough into 5 – 6 parts. Form it into a ball, flatten the disc and roll out a thin phyllo, flouring it either with flour or corn flour (starch). Place it on your working surface and cut it in the middle. Put both pieces next to each other and join them, by just pressing with your fingers to make a bigger square or rectangle piece. Brush it generously with olive oil and stretch it further by pulling the edges. Put some filling on one edge. Roll, once to cover filling and press the two edges so that the filling will not come out. While rolling brush it with olive oil and when done, twist the two ends towards opposite direction. This will stretch the dough and make it even bigger. Place it in an oiled baking tin one roll next to the other. If making a coil start in the centre and continue until the baking tin is full. Brush the phyllo on top with olive oil. If you have leftover phyllo, you can make Pischies, which are pastry with phyllo brushed with olive oil with cinnamon and sugar, pan fried and with honey drizzled on top. Contratulations to both of you, I shall contact both of you soon. If you win or buy the book or e-cookbook, a review is always welcome. Note: The above offer has expired but you can find the book on all Amazon stores, or directly from my site in pdf format. 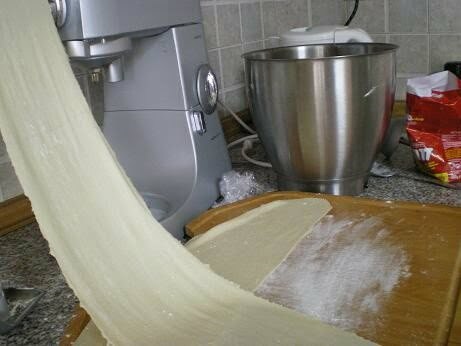 It’s so easy to roll out the phyllo using the pasta machine. I don’t have one so I have to always do it by hand! It’s a nice video Ivy! Very helpful! Your spanakopita looks amazing and I love your video. I have always wanted to try my hand at phyllo – now with your video I have no excuses! Great Video Ivy. Would love to try making it myself. Oh Ivy, I am thrilled, just thrilled to have won your e-book! And a huge congratulations to Rosa, too! As a dessert baker, I am so happy with the Savory dishes as it will really get me cooking savory dishes more! Thanks so very much! And I love the video! Congratulations on your first video and I think it is a great success. The quality is perfect and I hear you perfectly as well. And I am so glad Spanikopita is your first video. I love it and am fascinated at how you make it! I think you did a fine job — you’ve got a very good speaking voice! well you are hard to yourself !! good video Ivy !! Congratulations to the winners!! !I love your video…It has a great sound and I really enjoyed the recipe steps!!! Wow, Ivy, this is very nice and clear. The sound quality is great. Congratulations on your first video! I need to get a pasta machine definitly. It’s much much easier and faster to roll out phyllo than with hand. Thanks for the idea Ivy! First thing Ivy, I have to say the spankopita looks so delicious. The video is great and clear. You have nothing to worry about the video since you are not teaching how to make a video so having a clear video is great and authentic. Hi Ivy, I wish you the very best for the New Year! I love spanakopita, I used my grandmother recipe-also with yogurt-, but I’ll absolutely try yours. My very compliments for your homemade phyllo, you’re really great… I’ll have to try to do it by myself.The video is good and clear. Thank you Ancutza. Hope you will try making your own phyllo and I am sure that once you try it you will love it. Happy New Year! i AGREE WITH EVERYONE HERE§ After seeing this lovely video no excuses everyone needs to buy your books and try this pyhllo making. It’s very nice to see you Ivy in real life how you are, a very nice lady =) Thank you for sharing this method with us, everyone! Cheers! Unfortunately FB is down today and has been working only intermittently the last few days so I can’t post anything up there. I hope it’ll be OK tomorrow. It is getting quite interesting now. The pace is certainly picking up with some 130 countries having visited the site and asked questions about various aspects of the Greek language and Literature. The last twelve months, in particular I am very busy answering questions from all sorts of very interesting people. It is also the new academic year for the northern hemisphere so uni students and their lecturers are turning to my page. Silly FB! It drives you nuts! Love your new photo, by the way! Good morning again George. I just read your messages. Very interesting. You have a great kitchen! I love to cook with a great kitchen and cookwares. I was amazed on your page, it got video on how you cook Phyllo and I tried your recipes and method – it is really amazing meal. I love pasta,specially Red Sauce Pasta Recipe ,i don’t get much time for it .so i decided to buy a pasta maker after seeing your video.